In their most recent update, posted earlier today, the Quintana Roo Speleological Survey reported that the Quiet Diver Team has connected Cenote Herradura, Cenote K’oxul, Cenote Maya, Sistema Ak Tulum, Sistema Sand Crack, and Cenote Little Fish into one underwater cave system. The system, named Sistema Sand Crack, is already over 25 kilometers (15.5 miles) long. With much more yet to be surveyed, we can expect to be hearing more about this cave in the future. Meanwhile in nearby Sistema Rio Secreto, Peter Sprouse and his team have been busy surveying. 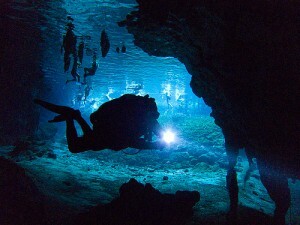 At now over 30 kilometers (18.6 miles) long, this dry cave is a welcome treat for non-cave divers visiting the area. Finally a new underwater cave, Cenote Cuzel Gasera, has been added to the website, as was new information on Cenote Muk K’in, Sistema Minotauro, and Sistema Umberto. There was also the hint of a soon to be released update on Sistema Taj Mahal.